The United Nations University is an organ of the United Nation established by the General Assembly in 1972 to be an international community of scholars engaged in research, advanced training, and the dissemination of knowledge related to the pressing global problems of human survival, development, and welfare. Its activities focus mainly on peace and conflict resolution, development in a changing world, and science and technology in relation to human welfare. The University operates through a worldwide network of research and postgraduate training centres, with its planning and coordinating headquarters in Tokyo. The views expressed in this publication are those of the authors and do not necessarily reflect the views of the United Nations University. United Nations University Press is the publishing division of the United Nations University. 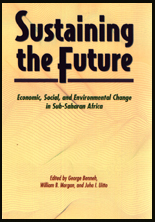 Urbanization and industrialization: What future for Sub-Saharan Africa?